This engraved tungsten & titanium ring set is a sentiment of love that can be inscribed with names, dates or a custom message. Our promise rings and wedding bands can be personalized with up to 25 characters per ring. IMPORTANT: Don't guess - find out how to accurately measure your ring size The most accurate way to determine your ring size is to visit a local jewelry store where they have several measurement tools to determine your ring size. 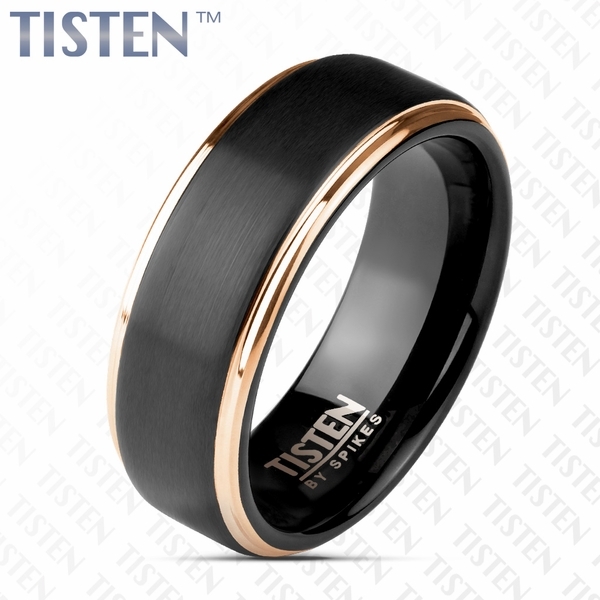 COMBINED MATERIAL: TITANIUM + TUNGSTEN The inspiration for TISTEN was derived from two of the most popular ring types available today, tungsten and titanium. Both are used extensively in the jewelry industry, and they have long been praised for their durability, attractiveness, and low cost compared to other precious metals. Tungsten is the element with the highest density, so you are guaranteed a tough product that can last a near lifetime. The jack-of-all-trades titanium is a fixture in several notable fields, such as medicine and aerospace engineering, and it is rapidly gaining popularity in the jewelry industry as well. Its light weight, luster, and permanence provided consumers with everything you can ask for from a ring. As impressive as they both are, now you can have the best of both worlds in one single product! A scratch-resistant, hypo-allergenic piece of jewelry whose endurance is matched only by the classy, stylish designs they are made in. The patented ratio of tungsten and titanium creates a symbiosis that brings out the best in each other. You don't have to wait, the next generation of rings is here!